Allison Paige is the artist, and the game is being created with Ren’py. Manny Baltazar will be composing the music. Rewards for backing include a copy of the game on itch.io, the soundtrack, a pdf of art sketches and ideas, and extra copies for a friend or someone who can’t afford the game. I love post-apocalyptic fiction, and the diversity of the cast is really appreciated. There’s a demo available, and I played it to get a taste of the full game. The art is excellent, with beautiful colors and expressive characters. I like that the mood is less dour than typical post-apocalyptic fare; it sets it apart. Even in the demo, there’s quite few dialogue options, which is great. I prefer when visual novels have a lot of dialogue choices instead of just advancing the plot without player input. The interaction with the two love interests available is very sweet. The demo sets up an intriguing world, and I look forward to playing the full game! The Kickstarter has a modest goal of $6,000. 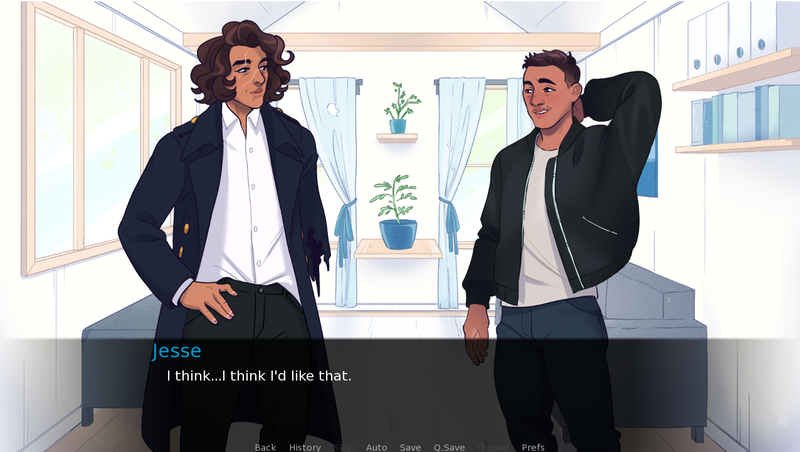 You can play the demo of Who We Are Now on itch.io for free! You can follow Bryce and Allison on Twitter. Allison also has a Tumblr where you can see more of their art. Back the Kickstarter here by Friday, April 14, 2017. The team hopes to have the full game completed by 2018.